Actor Akshay Kumar is at his best when he's in a comic mood. The 50-year-old actor recently performed at the Filmfare Awards, which were held over the weekend in Mumbai and he shared some his hilarious behind-the-scenes photos. 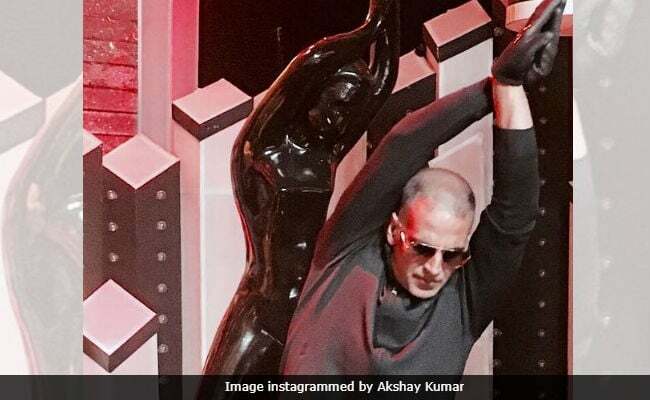 In one, Akshay tried to mimic the Filmfare statue's pose and wrote: "Cannot match the black lady's grace no matter how much I try. Nevertheless, feels good to be at the Filmfare stage after so many years." In another picture, Akshay shared the stage with Ranveer Singh, who stars in this week's Padmaavat, for which Akshay postponed the release of his PadMan to February. More than the caption, Ranveer and Akshay's picture will make you go ROFL. Akshay Kumar's critically acclaimed Toilet: Ek Prem Katha, which made it to Microsoft co-founder Bill gates' list of six positive things that happened in 2017, failed to fetch a black statuette at Filmfare. Toilet: Ek Prem Katha received three nods - Best Film, Best Director and Best Actor. As of now, Akshay Kumar is gearing up for the release of PadMan - the release date of which has been shifted from January 25 to February 9. Last week, Akshay Kumar met Padmaavat director Sanjay Leela Bhansali and announced the change of release date. "It is essential for them to release the film at this time, their stakes are higher than mine," Akshay said during a press conference. Padmaavat, which was earlier called Padmavati, was earlier scheduled to release on December 1. The film will now enjoy a single release during the Republic Day weekend amid growing protests from the Rajput Karni Sena, who want the film to be banned.